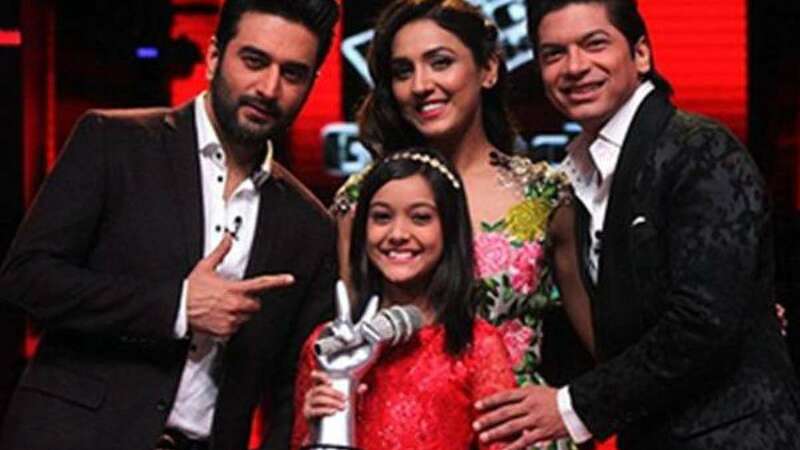 New Delhi : Nishtha Sharma from Uttar Pradesh on Sunday lifted winner's trophy in the first edition of famous children’s singing reality show 'The Voice India Kids'. With show mentors Shaan, Neeti Mohan and music director Shekhar Ravjiani, The Voice India kids had begun with nothing less than 94 contestants from different regions from India. Based on the talent, 18 kids were handpicked by mentors competing to win the show. Elimination of contestants every week from the show was based on the audience votes. From amongst the six finalists, three contestants from Team Neeti (Kavya Limaye, Vishwaprasad and Nishtha), two contestants from Team Shaan (Pooja Insa and Priyanshi Sharma) and one contestant from Team Shekhar (Shreya Basu) contested for the title. Upon winning the show, Nishtha has been handed over a check of Rs 25 lakh and a singing contract with the Universal music company. The runner ups Pooja and Kavya have been awarded with Rs 10 lakh each. Nishtha belongs to a musically inclined family of Sultanpur. Both her parents are music teachers and run a music institute, while her elder brother is pursuing B.A. in music. “I would sincerely like to thank my coach for mentoring me and guiding me towards victory. Also, my parents who stood by me and encouraged my passion for singing. It is a great platform for singers like me to realise our potential and get an opportunity to be mentored by stalwarts from the industry,” she said. The final episode of 'The Voice India kids' was up on Bollywood quotient too. Lead pair of upcoming movie Ae Dil Hai Mushkil – Anushka Sharma and Ranbir Kapoor – were the celeb guests who attended the show. As the first season concluded on a grand note, the audiences have been promised with the second edition of the show. “The Voice India Season 2" highlights the tagline “Awaaz Se Bada Na Koi”.